It is necessary to state at the outset what this book sets out to cover. 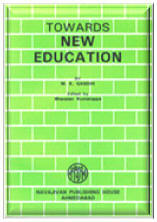 The Navjivan Publishing House has already published a book by Gandhiji on Basic Education. It deals with Gandhiji's writings and speeches on education primarily from the latter half of 1937 when he launched his new scheme of education. This new scheme came to be called Basic Education. It related to education to be given to a child from his 7th to 14th year. To this was to be added in course of time Pre-Basic and Post-Basic education relating to education before the 7th and after the 14th year respectively. The education covering all these three stages is what is comprised under New Education or Nai Talim. Gandhiji's ideas in regard to this New Education did not, of course, suddenly emerge from his brain in 1937, but were the outcome of long years of sustained thought and experience. The present book relates to this earlier formative period when he revolted from the prevailing system of education and sought in various ways to substitute it by educational practices it by educational practices more in harmony with his own conception of the function of education. To understand adequately the Basic Education scheme which he formulated in 1937 it is essential to go back to this earlier period where we can see it in origin and growth. The present book may, therefore, be said to be a necessary companion volume to the one on Basic Education. The material for this book was collected by Prof. Nirmal Kumar Bose and Prof. Anath Nath Bose. But for editing and arranging it in its present from they are not responsible. An attempt has here been made to arrange the writings in such a way that the reader may see for himself the evolution of Gandhiji's ideas in regard to Education. Section I deals with his period of revolt ; Section II with experimentation, and Section III and the others following with formulation of principles. It is hardly necessary to say that these sections are by no means rigid, for even in his period of revolt and experimentation we find Gandhiji formulating principles. Nevertheless it is hoped that classifying his writings thus will help to provide a clearer understanding of the development of his ideas. For the most part the titles of chapters and of extracts have been altered to suit the above arrangement.